I hardly dare say the S word - being more used to Storms and Soakings in recent months. But walking through the woods along the Dart today I saw some primroses which made my heart lift. 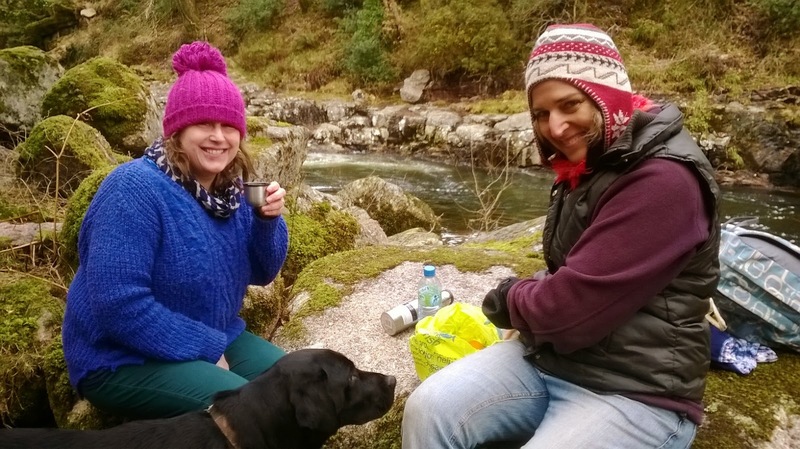 There were various landslips along the path, but the river glistened below, clear and shiny and green....I guess the rocks and river bed have been scrubbed clean by all the water rushing through. The water moved lazily through Sharrah Pool, making casual tendrils of bubbles on the surface. As we swam upstream, the cold burnt our limbs, but we got used to it as we fought the current. I looked up and saw a great crag up ahead, like a castle standing sentinel over the pool. It's the end buttress of Bench Tor, but in all the years I've swum in this spot I've never noticed it before. My motto of the moment is 'seize the day'. The weather has been so appalling, with the sea and the rivers so dangerously out of character, that swimming simply hasn't been possible on many days in the last few weeks. So when, out of nowhere, the sun appeared and the wind dropped, Jackie and I set off for an adventure to London Bridge, a natural rock arch in Torquay. We changed in unbelievably warm sunshine on the old concrete bathing platform before clambering over the rocks to start our swim on the other side of Saddle Rock. The water was milky turquoise and the sunlight glittered on the rock faces. 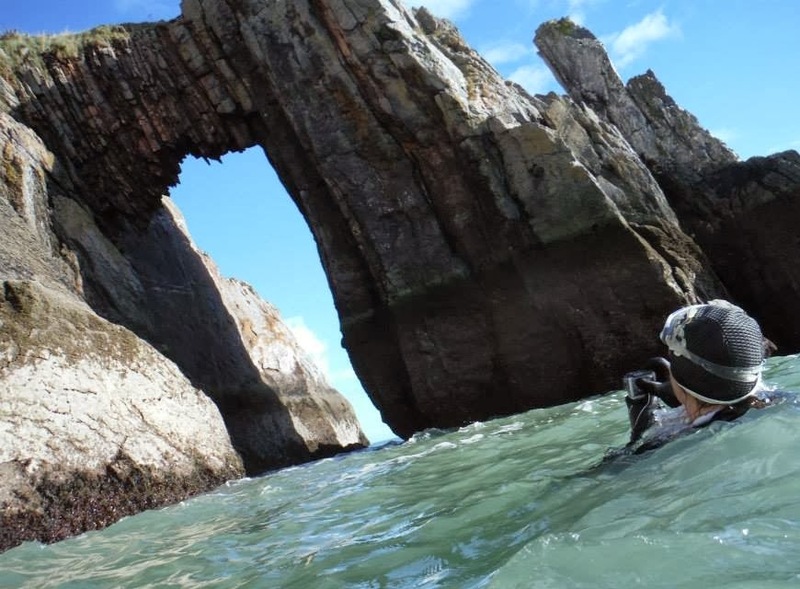 Although at a distance the sea had seemed flat calm there was quite a swell foaming through the Arch...I bounced through without a problem but didn't try and swim through the caves for fear of hitting my head. As we swam back we chatted away, finding it hard to believe that this was a February afternoon in the middle of some of the worst storms for decades. Thanks to Jackie for the picture. I love the excitement and anticipation of going off to find somewhere new. I thought I knew about all the pools on Dartmoor but then I read about one I'd never come across before and determined to find it. It was a miraculously sunny day in between all the storms, and our hike took us further and further into the Moor as the larks sang overhead. It was such a clear day we could see the rivers and hut circles in the distance marked out like a map. We followed a path but the final section of the journey involved a compass and a bit of bravery as we struck out across the mire in what we hoped was the right direction. Soon, like a mirage ahead, we saw a patch of glistening light, and there it was, the Holy Grail of our quest, a beautiful pool on top of the Moor in total and glorious isolation. It was a sunny Sunday at Fishcombe Cove in Brixham; the beach was in shade but we swam into the sun at Fishcombe Point. A hazy rainbow formed above us, one end perched above the Ore Stone in the distance. Then the sun really blasted us; a wonderful feeling as we bobbed around the rocky inlets at the end of the point. Considering the weather we've had, it was amazing to be swimming in such calm, beautiful sea, with 360 degree interest all round, from Hope's Nose, to the mussel farm, to Churston Cove, and the lighthouse on the end of the Breakwater. We swam back to Fishcombe Cove, and were about to get out when the cry of "He's behind you!" rang out. 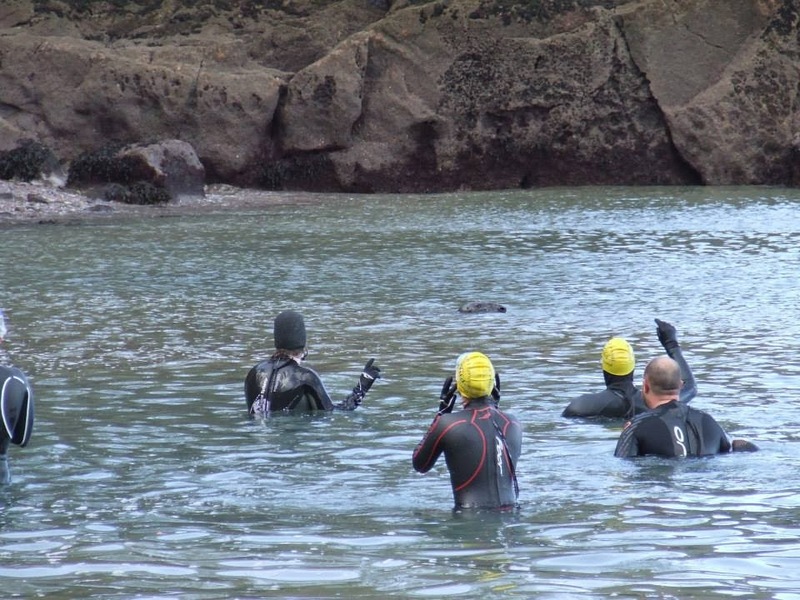 And there was Mr Seal, curious to see what we were all up to.Thanks to Allan for the seal pic.